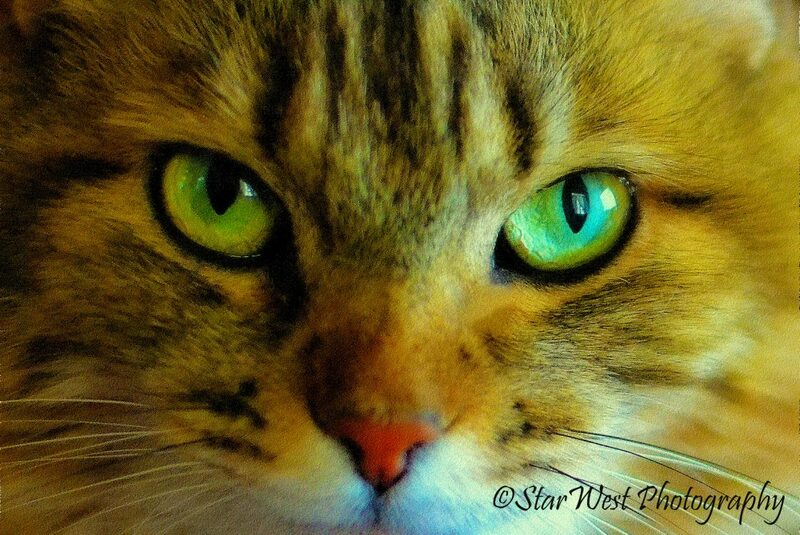 Star West has been a photographer most of her life. She considers herself fortunate to have studied photography early when it was still “film” and in the style of the great masters. Henri Cartier-Bresson, who is considered the father of photo journalism, and who coined the term, “the decisive moment,” was one of her great inspirations. The decisive moment is waiting for all the elements to come perfectly together. Star started out doing street photography in New York City, where she did freelance work, events, and also started a portrait business. She then focused on her own unique vision, doing fine art photography, which she sells on Etsy and at craft shows. Star managed a feral colony of 6 cats for five years. She was able to win their trust and love, and adopted one of their babies who was always found crying and alone under the shed. After she moved, she lost three of them; two died in her arms and one went missing. 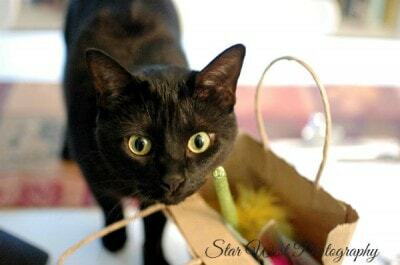 Star realized that being involved with cats was both her passion and calling. 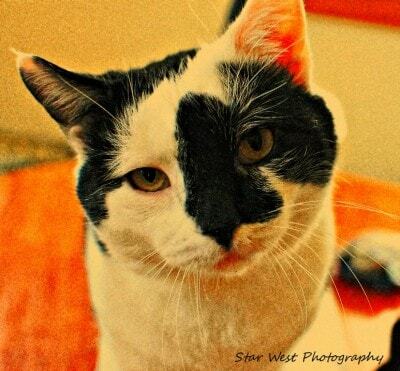 She started volunteering at Homeward Trails, and began photographing their cats. She realized what a huge difference good pictures can make in increasing their chances of finding their forever homes. 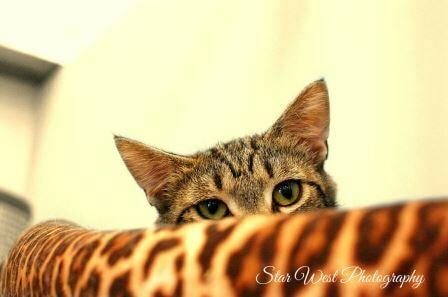 How did you get started photographing cats? 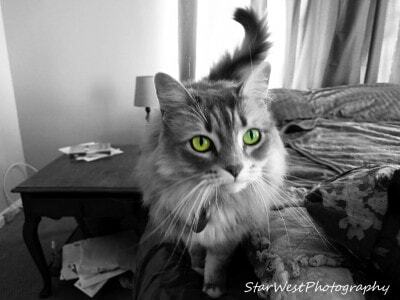 I started out photographing my feral cats and my baby Maya, then the rescue cats where I volunteer. I am now photographing for several different rescue groups, so that the pictures can be used to help them get adopted. 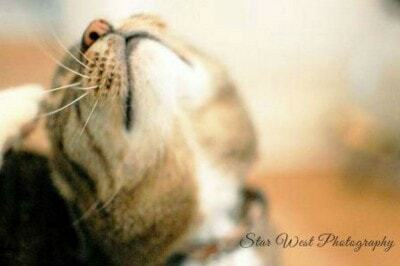 I am always amazed to see the photographs and the essence of each cat. I am mesmerized by their beauty, love, and intelligence. How do you approach a photo shoot with a cat? Very carefully, slowly, and low key. I reach out my hand and let them smell me and then pet them. If that goes well and it usually does, I immediately start taking pictures. How do you get a cat to look at the camera? I pet them and talk to them. I move around them. I call their name. If all else fails, I give them a treat, maybe some catnip. If necessary I have someone hold a toy that they like over the lens behind me. What is the most challenging experience you had while photographing a cat? A fairly recently adopted cat hid under the bed the entire time. The new guardian was not aware that she would do that. We tried moving the bed, to no avail. Finally I brought a lamp over and had to light the area under the bed and took the pictures that way. What is the funniest experience you had while photographing a cat? I was photographing some new kittens and one of the older cats who I immediately fell in love with wanted some attention, so while I was on my knees, he came over and sat on my calves. It was so funny and so sweet. Do you have any tips for our readers on how to get good photos of cats? If you are in a low light situation, you will need to use a higher ISO (film speed) and a wider aperture to let in more light. A wider aperture will also blur the background so that the focus on the cat will pop. Watch your backgrounds, so that nothing is distracting. Look for soft, even lighting, unless you are going for a special effect. Watch your color balance; depending on your camera, you can correct it in-camera in the settings. For example, if you are shooting under florescent lights, the picture will have a green cast. You will usually need to do a little editing after taking photos. It doesn’t have to be Photoshop, there are many simple programs you can use to correct contrast, sharpness, and color. Don’t be afraid to experiment with different filters and effects. If you are very serious, I would recommend a DSLR camera with a really good lens. I personally prefer a fixed lens as compared to a zoom. I use a 35mm lens with a 1.8 aperture opening. Focus on cats’ eyes and show a reflection of light in their eyes (catchlights). Come in close. Take a lot of pictures! Practice on your friend’s cats. Study the work of other photographers, especially the masters. Put your emotion and unique vision into your photographs. Wait for the purrfect moment when everything comes together purrfectly.